And also don't forget that the Russian Ukraine Adventure cost them access to some of the most experience rocket engine builders and facilities. S1 MECO is no where near orbital altitude and velocity. This was most likely just ice that fell off. S1 MECO is at T= +2:40. I am speaking about the object at T=+6:02. Also at that moment the S1 is no where near stable orbital altitude, but that object does look quite big and it doesn't really look like a piece of ice. Haven't watched that series...any discussion of how said hypothetical future mars colony is being financed? Is it guv or private in nature? Maybe just maybe my "bank of mars" idea might crop up in one way or another; one can hope. Last edited by williatw on Fri Nov 16, 2018 9:16 am, edited 1 time in total. Giorgio wrote: S1 MECO is at T= +2:40. I am speaking about the object at T=+6:02. Also at that moment the S1 is no where near stable orbital altitude, but that object does look quite big and it doesn't really look like a piece of ice. IIRC, the 1st stage would peak in altitude somewhere below 120 km. Unlikely to encounter orbital debris at that altitude. Orbital debris would be passing waaaay faster than that. You would not be able to even see it on the camera. Icesheets falling off the tanks can be quite big. Whatever this was, was moving at almost the same speed as the F9 first stage. Also note that there can be ice sheets falling off the stage frequently after MECO. It is November and it was very humid, which means more ice forming. I only watched this one episode. They didn't really talk about SpaceX's future plans at all (besides the general goal of a colony on Mars). In fact, it doesn’t mention BFR even once. They did talk about how SpaceX has been doing things no one would have imagined possible 10 years ago (including the fact that SpaceX would even get off the ground in the first place) and contrasted it with the declining space program budgets and cultures which had, over the past 50 years, created a clear trendline of decreasing launch capabilities that had left the goal of Mars an empty dream. The implied point being Musk’s vision might sound like a pipe dream, but somehow he has always found a way to make things work and, if nothing else, the idea of getting to Mars is very real now. I’m not sure Musk is concerned with how to sustain a colony at this point. I get the impression he has faith that once we get people on Mars, one way or another it will sustain itself and he is really just focused on how to get people there. Consensus on the SpaceX Facebook group is that it is a chunk of kerosene soot covered LOX ice. Several pieces can be seen breaking away from the base in earlier parts of the video. This piece appears right about the time that the re-entry chill-down was beginning, which involves LOX purge of the turbopump. Assuming this piece of ice was attached to the turbopump exhaust or in the throat of a Merlin engine bell, then the chill-down flow of LOX would likely dislodge that ice. Because there's a very slight amount of atmosphere (~ 1 micro-torr) at that altitude, the ice would break away, fall away from the engine and then the atmospheric drag would cause it to decelerate more than the much more massive rocket body. This slow motion deceleration, very alien appearing to us where the atmosphere is thick and would cause rapid decelerations, would make it appear to be a large object at a distance, while actually being only a few inches across. The mystery to me is that this object seems to be ahead of the stage as the stage overtakes it. The stage has done nothing except a flip end to end while continuing on a ballistic path from MECO. That implies to me that everything that was carried along from launch, ice or whatever is ruled out because it could not have passed the stage since MECO, and if it fell away from the stage before MECO it would be way behind, not ahead of the stage. Agreed, it is not a satellite at that low altitude and speed. It couldn't even be space debris because its speed is too low. Could it be something from the second stage? It doesn't look like a fairing half but I don't know what a fairing half might look like from that angle. There is still the problem that the object appears to be ahead of and below the stage. 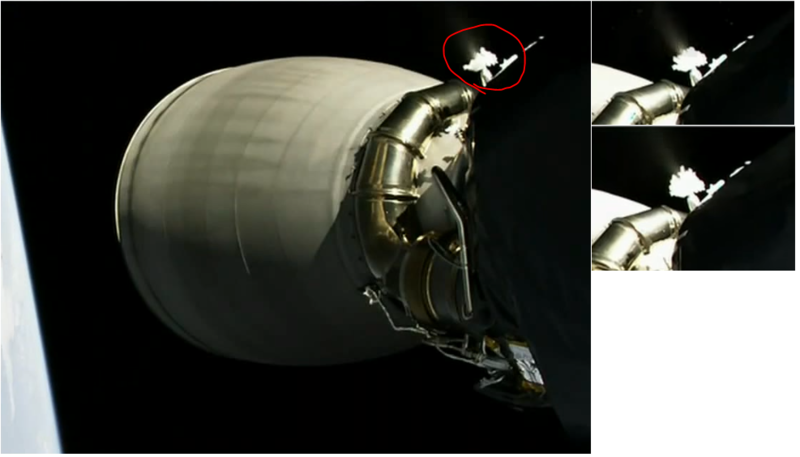 The fairing could be ahead of, but how could it be below the first stage? As for it being LOX ice from the stage itself being coughed out then slowed by drag, note that it is not the relative mass of the ice vs the stage that matters. it is the relative "fluffiness" of each object. LOX ice is not very fluffy, while the stage is nearly empty and so quite fluffy, relatively speaking. But this line of reasoning can only lead to an argument about the amount of gaseous oxygen entrained within the LOX ice so I guess we'll never know. More financing. More sustainable, in some ways. Aero wrote: The mystery to me is that this object seems to be ahead of the stage as the stage overtakes it. The stage has done nothing except a flip end to end while continuing on a ballistic path from MECO. That implies to me that everything that was carried along from launch, ice or whatever is ruled out because it could not have passed the stage since MECO, and if it fell away from the stage before MECO it would be way behind, not ahead of the stage. Based on the linked video clip, the first stage has already done the boostback burn, and is headed to its landing site. The object, whatever it is, is clearly falling more slowly than the first stage and in the same direction, thus the appearance of it moving the opposite direction. The first stage may be only a small fraction of its original mass, however, it still has a mass of many tons at that point so ice -- even big pieces -- will be much more affected by drag than the booster. edit: watched it again, and it appears i was wrong about the burn happening. however, the first stage is clearly headed back down at the point the object appears (already rotated to a retrograde orientation, and clearly pointed below the horizon). to me, the object looks to come from the "top" of the engine area (based on camera PoV) and pass very close to teh camera on its way up the booster body. i definitely agree that whatever it is, its a small object very close to teh rocket as it passes the camera. Sorry guys , no little green men or super secret squirrel satellite. It is oxygen ice from inside the nozzle on stage two when the turbo pump runs a pre-chill cycle before startup, hence the blueish hue to it.﻿ It falls on top of stage one then falls off. Also stage one pre cools before firing as well on its way back to landing unfortunately all the camera views are not available to the public and vary for each launch. The numbers varys from "a whole lot and even more than that" there are even event cameras in the lox / fuel tanks and everyplace else in a 360 degree coverage. Last edited by paperburn1 on Sat Nov 17, 2018 11:32 pm, edited 2 times in total.